What was the eventual solution to the Great Depression? Was it Roosevelt's deficit spending programme? Or was it WW2? The right answer is pertinent as the lawmakers of the world's last superpower lurch from crisis to crisis. The events surrounding the Great Depression echo strongly in the current crisis as Obama, like Roosevelt, enters the second term of his presidency with his hands tied. Useful lessons can be drawn by studying closely how Roosevelt almost came to being overwhelmed by the crisis. Keynesian economists have attributed the recovery from the Great Depression to the massive spending by Roosevelt's New Deal programmes which actually, like Obama's four annual trillion-dollar-plus deficits, didn't lead to any real recovery but merely bought Roosevelt enough time for the mother of all deficit spending, that is, the WW2 military expenditure. Roosevelt however was more fortunate than Obama as he was in the midst of the Third Kondratieff Wave. The Kondratieff Waves by the way consist of 5 waves. 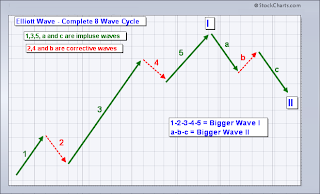 Each of these waves would evolve in the same manner as the ebbs and flows of the Elliott Waves (see left graphic from stockcharts.com). 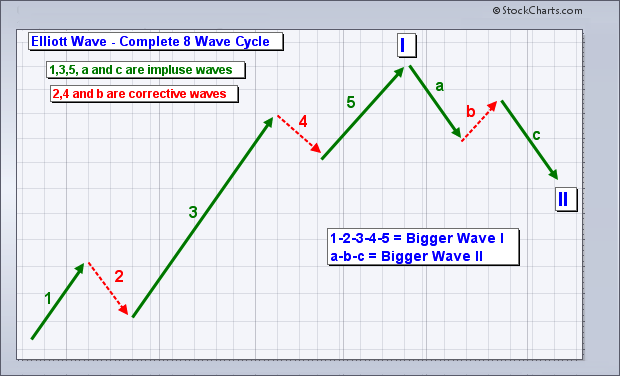 Each of Elliott's green impulse waves corresponds to one Kondratieff Wave. So right up to the Third Wave, the world witnessed the proliferation of nation-states, including the rise of the two biggest superpowers the world has ever known. The best tool to understanding the plight of any economy is of course the size of its credit market. Below is the usual credit chart of the US economy though this one appears a little bit exaggerated as its peak is shown to have exceeded 400% of GDP (my computation peaks at 385%). Regardless, our main concern is the shape of the credit movement because it enables us to weave a story, and this happens to be the best chart that I've managed to trawl from the web since not only it's the most up-to-date but it also provides a detailed movement by component over the longest time span. For this purpose, I've enlarged the chart so that we can see clearly the revealing details. The above chart can be deceiving especially in the Great Depression years. On first impression, most people would've thought that the crash was brought about by the credit collapse following the massive increase in credit quantity. Of course, credit did increase compared with the level in 1916 but that was insignificant relative to the level now persisting in the US economy. If you look closely at the years in the above chart, the sharp rise in the debt to GDP % occurred after the 1929 crash, at a time when credit was in fact falling. 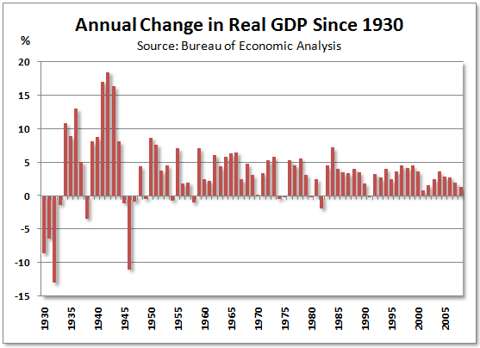 What actually unfolded was that the GDP itself was collapsing (see chart at left from Seeking Alpha). The fall in GDP from 1929 to the bottom of the Great Depression in 1933 reached 27% in real terms but because of severe deflation that figure very much understates the drop in current dollars which came to 46%. 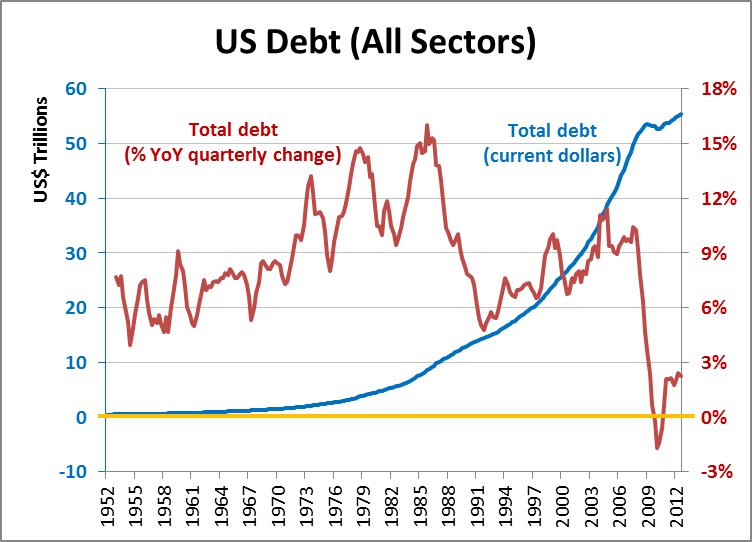 As the Debt to GDP % is based on current dollars, even if the credit quantity had remained static, the debt to GDP % would've more than doubled. If you compare its level in 1929 with that of 1933, it shows a jump of less than twice, implying that actual credit fell but at a much slower rate than nominal GDP. If the aberration of the Great Depression years is excluded, the normal debt to GDP % for the US economy historically had never exceeded 200% until Ronald Reagan unleashed his massive spending spree. Now how did Roosevelt engineer the recovery from the Great Depression? Actually he never did but anyway his story makes for an interesting reading. When Roosevelt took up the office of the President in 1933, he suspended gold convertibility, devalued the US$ by 69%, and kickstarted his New Deal programmes. From 1933 to 1937, industrial production went up by 60% and wholesale prices by 31% while unemployment dropped to 14%. But by 1937 Roosevelt wanted to balance the budget while the Fed started thinking of an exit strategy to its quantative easing. Now Obama has similarly expressed the need for a balanced budget. Pretty soon, you'll hear Bernanke broaching the end of his impotent QE. The reduction in deficit spending in 1937 and 1938 can be seen in the following budget chart (from markmartinezshow.blogspot.com). The effect of the move towards balancing resulted in more imbalancing as the GDP (see preceding chart) fell by 6% (current dollars) or 3% (real dollars) to register a recession in 1938. Effectively Roosevelt's New Deal failed in providing a sustained recovery. Absent the life support of government deficit spending, the economy soon tanked. As a result Roosevelt had to reverse course in early 1938 but too late to avert another recession. Fortuitously, WW2 erupted in 1939. 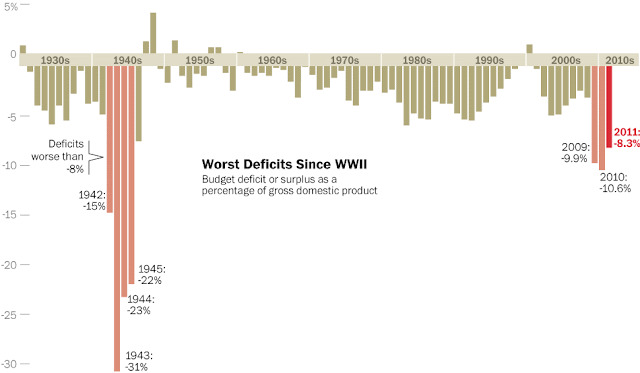 For the duration of WW2, the heavy deficits of the military spending supported the US economy. Because of the war exigencies, Roosevelt, unlike Obama, had congress on his side. After all no lawmakers wanted to be accused of lacking patriotism in times of war. After the war, the government substantially reduced its spending in 1946, sending the economy into another recession. This proved that the deficit spending, whether on entitlements, infrastructure or military, wasn't the real solution to the Great Depression. Buoyed by rising incomes and profits following increased factory mechanisation, it was the private sector that took on the task of post-war spending on automobiles, homes and their spin-off stuff which had been suppressed during the war years. Businesses invested in new factories or retooled from military to civilian production. The baby boom that stretched from 1946 to 1963 further fueled the demand for schools, hospitals, suburban homes and roads. Liberal or Keynesian economists, have exhorted the government to spend in a big way to escape from another looming depression. They have used the example of the massive spending during the Great Depression to support their case. But that example is wrong because the spending under the New Deal and during WW2 only bought time. Furthermore as explained earlier, the steep increase in the Debt to GDP % during the Great Depression was due to a measurement quirk. 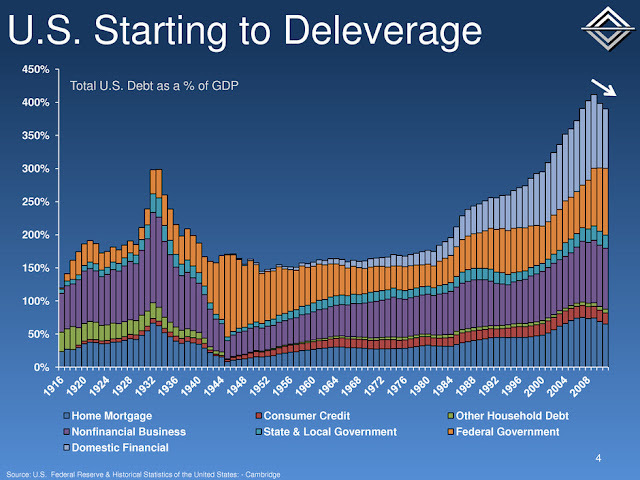 In contrast, the debt situation now is colossal, running at almost quadruple of GDP. The US government is in a much weaker position, more so when the prevailing trend now favours smallness. A superpower is a dying breed, now that the USSR is long gone. There's no compelling reason to maintain another. Keeping a superpower alive is expensive because of the need to feed its voracious appetite. The blue curve in the chart above tracks the nominal amount of the US credit market. The steep increase in debt occurred around the time the USSR splintered. Since then the US economy has been on credit support (see also the Debt to GDP % chart (second chart above)), with more credit needed for every dollar of GDP. But this is no longer sustainable. That's why credit is under severe pressure to come down (see red curve above). Many US lawmakers are in the erroneous belief that lowering the deficit is good for the economy. Actually it would lead to a recession or more likely a depression but that's the price for the uncontrolled excesses of the past. Much worse is having a bunch of lawmakers that have absolutely no clue on the future direction of the economy.